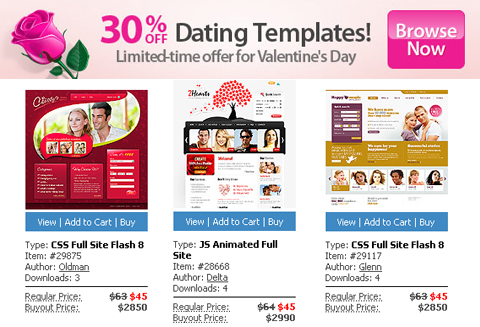 Would you like to get 30% off any dating template or wedding template? Then visit TemplateMonster.com and make the best of the recently announced Valentine’s Day promo. 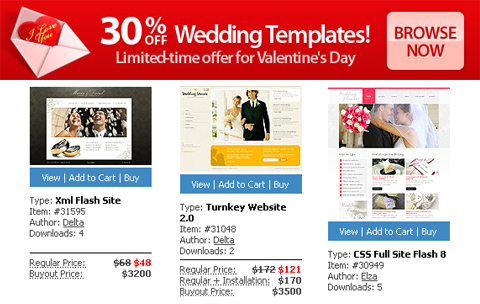 These days Template Monster is offering discount rates on all templates that fall into dating and wedding categories. Whether you’re looking for website templates or Flash templates, Joomla templates or WordPress themes, Magento themes or osCommerce templates, you can get them at a special price. However, the offer will expire on February 14th, 2011. So, you have about two weeks to save 30% when you buy templates with cute love images and photos. And please remember, dating templates and wedding templates are now lower in price, not in quality. To see all discount items please click on the images below. The case is both images are linked to the pages offering dating templates and wedding templates at 30% off with a free 24/7 support and a year of free hosting. This entry was posted in Holiday Website Templates, Special Offers and tagged Dating Templates, discount, discount templates, love, relationship, templates, Valentine’s Day, Wedding Templates. Bookmark the permalink.